This report provides examples of policy options that raise significant revenue from high-income households and reverse the damage from TCJA and prior rounds of tax cuts that disproportionately benefited the well-off. Any true federal tax reform plan would, at a minimum, include these revenue-raisers, among other provisions. Most of this report is organized into brief sections describing each option, and most end by linking to other ITEP research that describes the options in greater detail. A section toward the end of this report illustrates the progressive impact of these options. This report describes seven revenue-raising options, some of which have multiple components. Repeal TCJA’s 20 percent deduction for pass-through business income. Replace TCJA’s cap on deductions for state and local taxes (SALT) with a dollar cap on all itemized deductions. Repeal tax breaks for capital gains. Reverse TCJA’s cut in the estate tax and further strengthen it. Eliminate tax breaks for offshore corporate profits. Enact a 1 percent wealth tax on the top 0.1 percent’s net worth. All but one option would eliminate or limit special breaks and loopholes. The first three options would change the personal income tax (including eliminating a break for pass-through businesses, which are subject to the personal income tax). 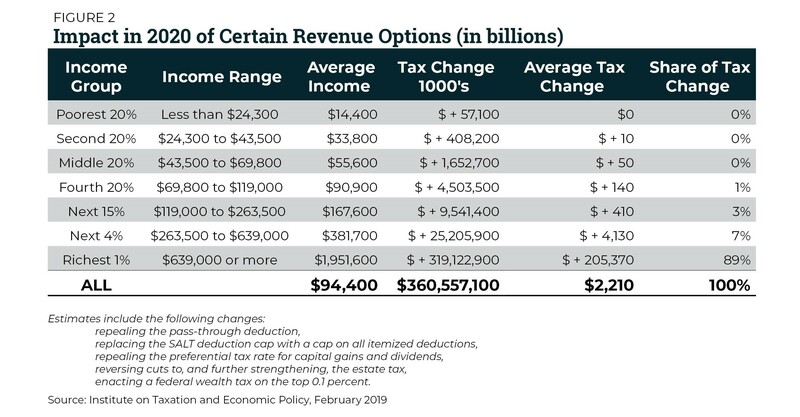 The fourth would change the estate tax and the fifth option, to curb accelerated depreciation, would affect both businesses taxed under the personal income tax and those subject to the corporate income tax. The sixth option would solely affect corporate income taxes paid by multinational companies. The final option introduces an entirely new tax, creating the first federal tax that is assessed on a household’s net worth rather than its income or the transfer of an estate. TCJA includes a 20 percent deduction, with certain limits, for income from pass-through businesses, which is subject to the personal income tax instead of the corporate income tax. While some equate these enterprises with “small businesses,” they include many enormous companies. Most pass-through income flows to the richest 1 percent of Americans. The provision’s seemingly arbitrary rules regarding which types of businesses can or cannot receive this tax break and its vague definitions appear designed to encourage taxpayers to devise schemes to use this tax break in ways that lawmakers never contemplated. For example, legal practitioners are subject to sharp limits on this deduction, but real estate investors are not, raising the question of whether a law firm could spin off its real estate assets (its office buildings) to a newly formed company that could use the deduction. The law prohibits companies from applying this deduction to employees’ salaries, but companies might get around this by turning employees into independent contractors. The deduction is likely to encourage these legal and accounting maneuvers to recharacterize activities that do not qualify for the deduction as activities that do. Like many of TCJA’s provisions, the pass-through deduction expires after 2025. For this reason, repealing it raises revenue mainly through 2025. Itemized deductions have long been in need of reform. Congress has, over time, decided to subsidize activities like home buying and charitable giving through the tax code by providing deductions. Itemized deductions typically are claimed by well-off households whereas low- and middle-income households are more likely to claim the standard deduction. The benefit of deductions is greater the more income a household has. This happens because the tax savings equal the amount deducted times the marginal tax rate. Instead of comprehensively solving these problems, TCJA mainly limits one itemized deduction, the deduction for state and local taxes (SALT), with a new $10,000 cap. The provision targets residents of higher-taxed states more than others. However, simply repealing the cap on SALT deductions, as some have proposed, would result in an expansion of TCJA’s tax cuts for the rich. One solution is to replace the SALT deduction cap with a new limit that would apply to all itemized deductions. The example provided here would cap households’ total itemized deductions at $50,000 for married couples, $30,000 for singles and $40,000 for heads of households and would be annually adjusted for inflation. The estimates provided for this option assume that all TCJA provisions not discussed in this report remain in effect through the decade. If TCJA’s temporary provisions are allowed to expire after 2025 as scheduled, this option would raise even more revenue in years after that. For more about this option and others like it, see ITEP’s report, A Fair Way to Limit Tax Deductions. The federal government taxes income from wealth less than it taxes income from work. One type of income from wealth that is undertaxed today is capital gains, profits generated by selling an asset for more than it cost to purchase. The most significant tax break for capital gains is the special, lower personal income tax rates that apply to both long-term capital gains and corporate stock dividends. If Congress only eliminated these preferential tax rates, wealthy people might partly avoid the tax increase by using other special breaks, which Congress should address as well. One is the exclusion of capital gains on assets passed to heirs or to charity from taxable income. This break further enables the dynastic wealth that is a feature of income inequality. Another break allows taxpayers to defer paying taxes on gains until assets are sold. While it might be difficult to eliminate this break entirely, Congress could address the worst abuses by eliminating so-called like-kind exchanges (in which taxpayers claim that a transaction is a swap of similar properties rather than a sale that would trigger income tax) and subjecting derivatives to “mark-to-market” taxation (taxing gains on derivatives each year regardless of whether any sale occurs). In other words, eliminating just one break for capital gains could trigger behavioral effects that limit the revenue raised, but a package that combines these reforms may not. While it is unclear how Congress’s official revenue estimators would analyze this package of reforms, the estimates provided here exclude such behavioral effects given that they may not be significant. The estimates assume that all TCJA provisions not discussed in this report remain in effect through the decade. If TCJA’s temporary provisions are allowed to expire after 2025 as scheduled, this option could raise even more revenue in years after that. For more about this option, see ITEP’s report, Congress Should Reduce, Not Expand, Tax Breaks for Capital Gains. Before Congress enacted the Tax Cuts and Jobs Act, individuals could leave more than $5 million to their heirs without paying the tax, and a married couple could leave twice that amount. Most wealthy people could leave far more than that without paying the tax thanks to some breaks that have merit (such as the deduction for charitable bequests) and some loopholes that have no merit (various schemes to stash assets in trusts, for example). Instead of closing loopholes that have weakened the estate tax, the Tax Cuts and Jobs Act further weakened it by doubling the exemptions. Now an individual can leave at least $11.2 million (and a married couple can leave behind $22.4 million) without paying the estate tax. For more about this option, see ITEP’s report, The Federal Estate Tax: An Important Progressive Revenue Source. Accelerated depreciation allows businesses to write off the cost of investments in equipment more quickly than the equipment wears out. Proponents argue that it encourages companies to invest and expand their operations, thereby growing our economy, but research shows that It is more likely to reward business owners for investments they would have made regardless. Despite its ineffectiveness, accelerated depreciation has been a permanent feature of the federal tax law for some time. Moreover, Congress passed temporary expansions of this tax break, called “bonus depreciation,” during the recession and extended it several times since then. TCJA goes even further. It allows “full expensing,” which is the ability to write off the entire cost of an investment in the year it is made. Congress should repeal not just the full expensing provision but even some of the permanent accelerated depreciation breaks in the tax code. The revenue impact is unclear but undoubtedly would be substantial. Several years ago, Congress’s official revenue estimators concluded that repealing accelerated deprecation altogether would raise around $700 billion over a decade, with the revenue impact declining somewhat in years after that. For more about this option, see ITEP’s report, The Failure of Expensing and Other Depreciation Tax Breaks. TCJA failed to solve fundamental problems in our international corporate tax rules and in some ways made these problems worse. Congress could have fixed many problems by following one simple principle: tax offshore profits of American companies the same way their domestic profits are taxed. The old rules and the new rules are both problematic because they tax offshore profits of American corporations more lightly than domestic profits. The old rules did this by allowing American corporations to “defer” paying U.S. taxes on offshore profits until those profits were officially brought back to the United States. The new rules, enacted as part of TCJA, do this by taxing offshore profits at a lower rate than domestic profits. Both the pre-TCJA approach and TCJA’s approach encourage American corporations to use accounting gimmicks to make profits earned in the United States appear to be earned in other countries or to actually move real investments and even jobs offshore. The ideal reform would eliminate TCJA’s main offshore provisions, which exempt offshore profits equal to 10 percent of tangible profits held offshore and tax any offshore profits beyond that amount at just half the rate imposed on domestic profits. For an explanation of different approaches to this option, see ITEP’s report, The New International Corporate Tax Rules: Problems and Solutions. For more detail, see ITEP’s report, Understanding and Fixing the New International Corporate Tax System. Congress should consider adopting the first comprehensive federal wealth tax and target it toward the wealthiest 0.1 percent of households. An annual federal tax of only 1 percent on the portion of any taxpayer’s net worth exceeding the threshold for belonging to the wealthiest 0.1 percent (likely to be about $32.2 million in 2020) could raise nearly $1.3 trillion over a decade. Taxing income will not, by itself, address inequality because the wealth gap is much greater than the income gap in America, and because the income tax cannot address the ways in which net worth grows much more quickly for the wealthy, particularly in the form of unrealized capital gains which are not touched by the income tax. The administrative challenges of enforcing a federal wealth tax are real but not insurmountable. The IRS already has some tools to tax wealth because it enforces the estate tax, which is a wealth tax that is imposed at the end of, rather than throughout, one’s life. Critics claim that a wealth tax would be unconstitutional, but the clauses of the Constitution that they refer to were part of a compromise the framers’ made to allow slavery in the United States and should be interpreted very narrowly given the obviously different context in which we live today. For more details about this proposal, see ITEP’s report, The U.S. Needs a Federal Wealth Tax. enacting a federal wealth tax on the top 0.1 percent. The distributional impact of the other capital gains reforms is uncertain but likely to be similar to that of repealing the preferential rates, which mainly benefit the richest 1 percent. The distributional impact of curbing accelerated depreciation and ending breaks for offshore corporate profits is likely to be quite progressive. One reason is that corporate income tax increases are mainly borne by owners of corporate stock, who may receive smaller dividends when corporations pay higher corporate income taxes. ITEP follows the convention of Congress’s official revenue estimator, the Joint Committee on Taxation (JCT) in assuming that owners of corporate stock bear the entire corporate tax increase the first year after it is enacted and then gradually, over the course of a decade, labor bears an increasing share until it bears one-fourth of the tax increase at the end of the decade. (This means that in the 10th year, a fourth of the corporate tax increase is distributed the way labor income is distributed in America.) Even then, owners of capital (who are mostly high-income households) bear most of the tax increase. Even the portion borne by labor is tilted toward those at the top because the highest-compensated individuals receive a disproportionate share of labor income. All options described in this report are assumed to go into effect in 2020, the year reflected in Figure 2, which illustrates the effects on households’ 2020 tax liability. In some cases, this reflects tax increases that might not be paid until after 2020. 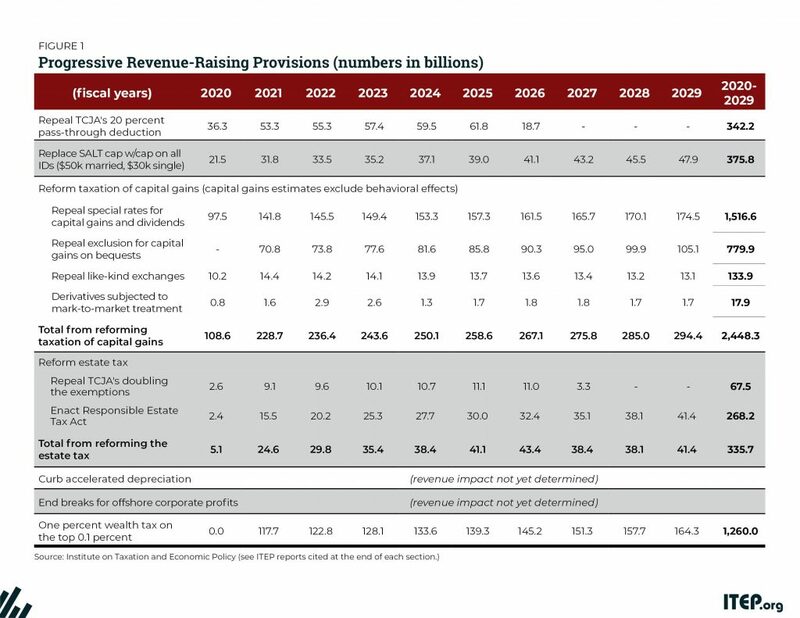 For example, earlier in this report, Figure 1 shows that the estate tax option raises little revenue in 2020. That would happen because 2020 estate tax liability is based on estates of those who die in 2020, but the estate tax would typically not be paid until the following year. Similarly, Figure 1 shows that the wealth tax, which is assumed to go into effect in 2020, does not actually raise revenue in that year because it is assumed that the tax assessed for 2020 would be paid the following year. For simplicity, the illustration of distributional impacts in Figure 2 reflects changes to 2020 tax liability regardless of when those taxes are paid. Increasing taxes may or may not involve increasing tax rates. The options presented in this report illustrate the potential revenue and distributional impacts of changes that do not raise rates but rather eliminate or curb special breaks and loopholes, which should be the first step in formulating a tax reform plan. If Congress raises marginal income tax rates affecting high-income individuals but made no other changes, then those individuals can respond by relying more heavily on existing special breaks and loopholes to avoid the tax increase. For example, if Congress raises the top marginal personal income tax rate for ordinary income without eliminating the special, lower rates for capital gains and dividends, high-income households would find ways to characterize more of their income as capital gains and dividends. The same is true for corporations. If Congress raised the corporate income tax rate without eliminating breaks for offshore profits, then corporations could respond by relying more heavily on accounting gimmicks that make their domestic profits appear to be earned in low-tax, foreign countries. Even worse, corporations could respond by shifting more real assets and jobs offshore. The ideal approach would be for policymakers to first determine just how far they can go in shutting down special breaks and loopholes with reforms that could include those described in this report and many others as well, and determine how much revenue these reforms would raise. With that knowledge they can then determine what tax rates should be enacted based on how much more revenue they need and how much more work must be done to address inequality. Americans have long believed that high-income households and corporations pay too little in taxes and some lawmakers are finally starting to respond to the popular demand for more progressive tax policies. Several policy changes are needed to ensure that high-income taxpayers, who benefited disproportionately from the tax changes of the last several decades, make a fair contribution to invest in shared prosperity. A comprehensive package of reforms is necessary because piecemeal tax policy changes may cause households to avoid any tax increase by simply shifting to activities and investments that continue to be lightly taxed. For example, closing corporate tax loopholes while leaving TCJA’s massive deduction for pass-through businesses in place might cause the wealthy to shift their investments from companies that are subject to the corporate income tax to pass-through businesses, which are not subject to the corporate income tax. The reforms described in this report are a sound starting place for lawmakers as they consider how to reform the tax code and finance an ambitious agenda to improve the lives of ordinary Americans.